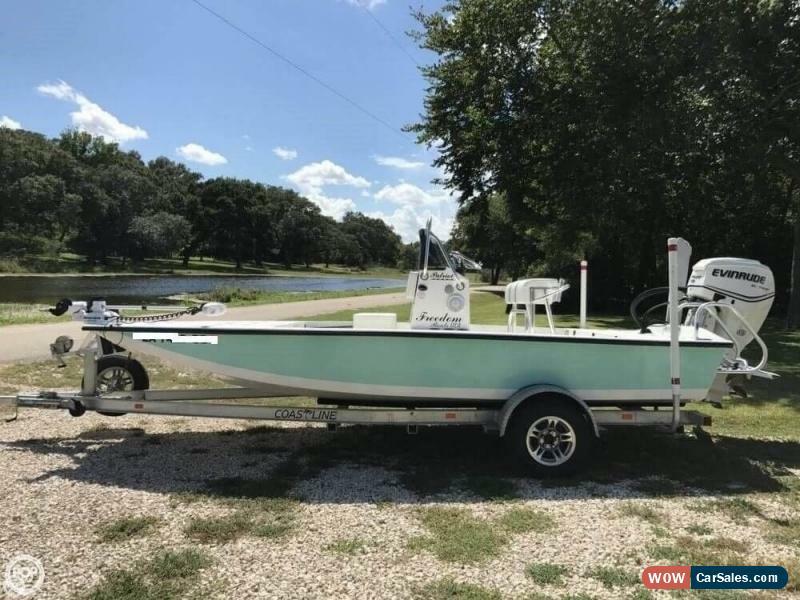 If you are in the market for fishing, look no further than this 2013 Freedom Boats USA Patriot, just reduced to $27,900 (offers encouraged). This boat is located in Freeport, Texas and is in great condition. She is also equipped with Evinrude engine that has only 125 hours. This listing has now been on the market couple months. Please submit any and all offers today! At POP Yachts, we will always provide you with TRUE representation of every vessel we market. We encourage all buyers to schedule survey for an independent analysis. Any offer to purchase is ALWAYS subject to satisfactory survey results. 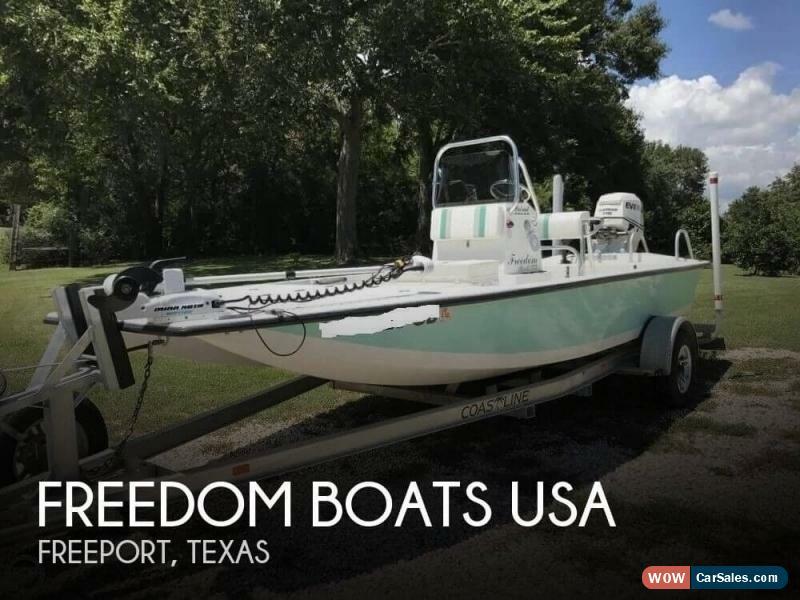 Take look at ALL ***46 PICTURES*** of this vessel, AND VIDEO, on our main website at 2013 Freedom Boats USA Patriot. We appreciate that you took your time to look at our advertisement and we look forward to speaking with you! 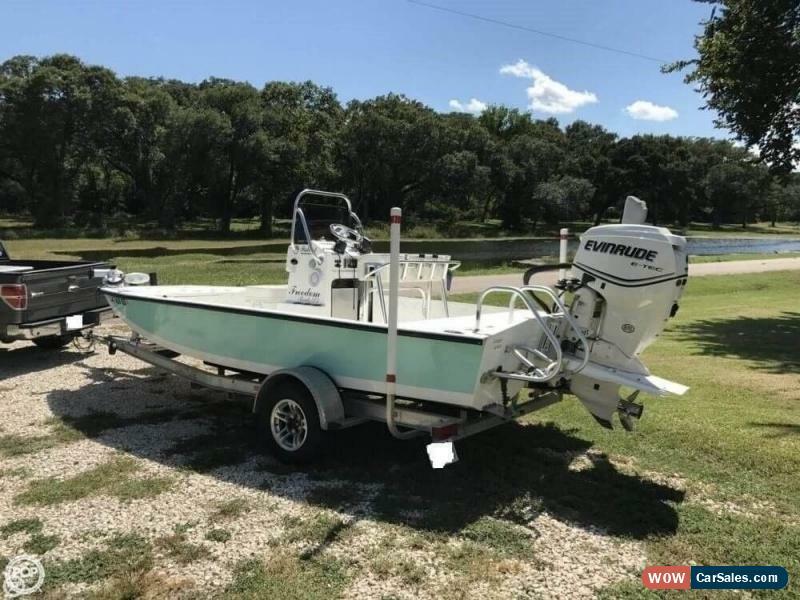 Video	Options and Standard Features	Options		Anchor: Traditional And Power Pole		Anchor Chain: Included		Bait Well: Included		Bench Seat: Included		Boat Cover: Full Cover Brand New		Casting Deck W/Storage: Included		Center Console W/Storage: Included		Cleats: Drop Down Cleats Stainless		Compartment Storage: Included		Cooler Mounts: Yeti Casting Pad Cooler Mounts		Cooler Seat W/Backrest: 94 Quart Igloo		Cushions: Included		Live Well: Included		Non-Skid Deck: Included		Pedestal Seats: Included		Push Pole: Included		Rod Holders: Included		Rod Storage: Included		Spare Prop: Aluminum		Spot Lights: One Handheld		Steering Wheel: Included		Storage: Included		Storage Cover: Included		Swim Ladder: Included		Under Gunwale Rod Storage: Included		Vertical Rod Holders: Included		Winch Handles: Included		Winches: Included		Windshield: Included		Leaning Post: Included		Mooring Cover: Included		Self Bailing Cockpit: Included		12 DC Outlets: Cigarette Lighter		Accessory Switches: Included		Alternator: Included		Battery Charger: Included		Battery Perko Switch: Included		Circuit Breaker: Perko Switch		Engine Kill Switch: Included		Fuel Gauge: Included		Hour Meter: Included		Ignition: Key Ignition		Location Of Battery: Two In Front, One In Back		Number Of Batteries: 3		Tach: Included		Transducer: Included		Trolling Motor Batteries: 12 Volt With Charger		Engine Alarms: Included		Engine Flush: Included		Fuel Filters: Included		Fuel Injected: Included		Location Of Engine: Outboard		Location Of Fuel Tank: Aft		Number Of Eng Cylinders: 4		Number Of Fuel Tanks: 1		Oil Injected: Included		Oil Injection Tank: Included		Power Pole: 8'		Power Tilt Trim: Included		Propulsion: Included		Trolling Motor: Minnkota 70 Lb.Riptide		Trolling Motor Prewire: Included		Type Of Cooling System: Saltwater Cooled		Type Of Steering System: Power		Warranty: Ten Year Provided By Freedom Boats		Compass: Included		Depth Sounder: Included		Display Covers: Included		Navigation Lights: Included		Spotlight: Included		VHF: Handheld		Chartplotter: Garmin 5245		GPS/ Fishfinder/ Plotter: Garmin 5245		Air Horn: One Handheld		Fire Extinguisher: Handheld		Flares: Hand Held		Life Jackets: 4		Throwable PFD: Included	Basic Information	Year: 2013	Make: Freedom Boats USA	Model: Patriot	Stock Number: 135520	Condition: Used	Type: Center Console	Use: Not Specified	Length Beam	Beam (Feet): 8	Length (Feet): 18	Hull Type	Hull Material: Fiberglass	Engine	Fuel Type: Gasoline	Engine Make: Evinrude	Engine Model: E115DSLABA E-TEC	Engine Hours: 125	Cruising Speed: 28	Max Speed: 35	Fuel Capacity	Fuel Capacity (Gallons): 21-30	Exterior	Color: Seafoam		Similar Vehicles	Check out similar vehicles in our inventory. View Inventory	Contact	Ask for:Sales Department	Contact:	Contact Us	Main:(941) 803-7098	Showroom Terms	We make every effort to present information that is accurate. However, it is based on data provided by the vehicle manufacturer and/or other sources and therefore exact configuration, color, specifications accessories should be used as guide only and are not guaranteed. We are not liable for any inaccuracies, claims or losses of any nature. Inventory is subject to prior sale and prices are subject to change without notice and cannot be combined with any other offer(s). The price for listed vehicles as equipped does not include other charges such as: License, Title, Registration Fees, State or Local Taxes, Smog Fees, Credit Investigation, Optional Credit Insurance, Physical Damage of Liability Insurance, Delivery Fees, Finance and/or Documentation Fees. Any and all differences must be addressed prior to the sale of this vehicle. Selling Vehicle? Create Professional Listings Fast and Easy. Click Here! Copyright © 2017 Auction123 All rights reserved. Disclaimer	Auction123 (a service and listing/software company) and the Seller has done his/her best to disclose the equipment/condition of this vehicle/purchase. However, Auction123 disclaims any warranty as to the accuracy or to the working condition of the vehicle/equipment listed. The purchaser or prospective purchaser should verify with the Seller the accuracy of all the information listed within this ad.